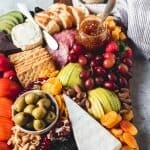 Learn how to make the best fruit and cheese platter that is perfect for entertaining anytime of the year with this easy tutorial! This is more than just cheese and crackers. It can be an elegant and impressive spread that is sure to delight guests. Variety of cheeses: Aim for a mix of textures, shapes and strengths. Variety of fruits (fresh or dried): Apples, pears, cherries, berries, grapes, apricots, persimmons, oranges, dates, etc. Something salty: Olives, cornichons, mustard, cured meats or nuts. Start by arranging larger items on a large, flat surface like a cutting board. Items in containers like bowls of olives, small jars of jam, or a ramekin of honey are a good starting point. Next, place a variety of cheeses on different corners of the board. Place a cheese knife next to each selection so the flavors don't get mixed. Arrange sliced crusty bread or crackers near the cheese. Try not to go overboard since these can take up a lot of real estate on your fruit and cheese platter. Sometimes I serve these in a separate bowl or plate next to the fruit and cheese platter instead. Set cured meats like salami or summer sausage on the board next. Add larger fruits like sliced apples, pears, persimmons, pomegranate segments, and so on, filling up the board. Fill in empty spaces with smaller fruits like grape clusters, berries, dried fruit, nuts, and squares of dark chocolate.